VT: The following testimony was originally written in Spanish. You can read the original testimony here. It is beautiful to see how each person's love story with Jesus Christ is unique and unrepeatable. The creativity with which He calls everyone is impressive. He surpasses all our thoughts. 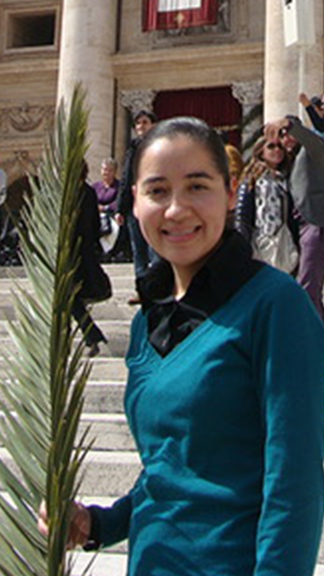 My name is Guadalupe Salas Lira, I am 31 years old from Zacatecas, Mexico and I’m the fourth of six children. During my childhood, I lived with my parents and siblings in a joyful, lively catholic home. I remember my mother teaching us how to pray and what is pleasing in the eyes of God. In 1998 my family immigrated to the United States and so we were separated for a year until God’s providence reunited us in the city of Austin, Texas. From adolescence, I had great aspirations: I wanted to do many things and one of my most important dreams was to help the poor. I also desired to have my own family, find a good man, get married, have children and find a good job. I knew that in order to achieve some of my dreams I had to study. So, I enrolled in Texas State University at San Marcos to study graphic design. After graduating in 2012, I worked for a while as a self-employed graphic designer. In the same year, I decided to experience religious life with the Missionaries of the Divine Revelation in Rome. Thank God, my family supported me in this decision even though they didn’t understand what I desired to do. 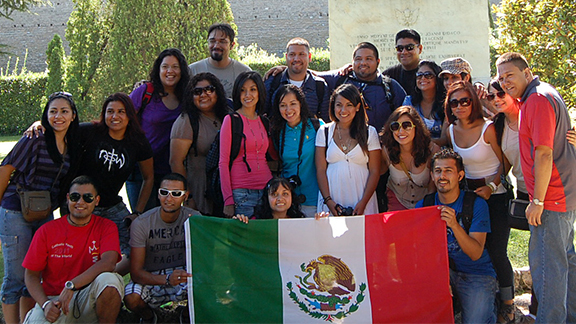 On August 11th, our group arrived in Rome, accompanied by Father Jesus Ferras. During our stay in Rome, we had the privilege of participating in several Art and Faith tours to the major religious sites, accompanied by the Missionaries of the Divine Revelation. There are no words to express the beauty of the churches and the places that we visited. I was only able to contemplate them. All the majesty of these places spoke of a beginning, of a Creator, of a Father. Although I did not realize it at the time, through the dazzling beauty of these sites, the Lord had started to whisper my life’s mission in my heart. On August 13th, our group visited Tre Fontane (Three Fountains) where St. Paul was martyred. Here I met Mother Rebecca, Superior of the Missionaries of the Divine Revelation, for the first time. As we walked towards the place where St. Paul had been beheaded, my friends and I started a conversation with the sisters. During this conversation, Mother Rebecca invited us to experience the religious life for as long as we liked, without any commitment. I immediately dismissed this invitation because I thought that it was so far away from the plans I had made for my life. Following our pilgrimage to Rome, our group travelled to Madrid to participate in World Youth Day with Pope Benedict XVI. Here, other great blessings awaited us. Everything that I experienced during the journey was very significant, but in particular two events touched my life. The first was a presentation on the life of Saint Teresa of Calcutta in a museum. I was very impressed about her mission but, at that time, I did not understand how a person could donate her life so completely to God and others. The second event occurred on August 20th, the day of the Prayer Vigil. During Eucharistic Adoration, I began to pray and to thank the Lord for the things I had done in my life. I remember that I felt so much peace and joy, I cried so much and something changed in me during that vigil. I believe that from that moment, without realizing it, my heart began to open to God’s will. Sr. Maria Angélica visiting the sisters in Rome. After the World Youth Day, we returned to Austin and I began to reflect on my life and I realized that I had always done what I had planned, but I had never asked myself what the Lord wanted me to do. I cannot say that after this experience I thought about consecrating myself to the Lord, but I can say that the desire to truly know Him, love Him, serve Him and know my Catholic faith was born from this experience. Therefore, I contacted the Missionaries of the Divine Revelation to know more about the faith. Slowly, I started to seriously consider the prospect of a few months experience of the religious life with the community. I started a period of discernment with Mother Rebecca. Each week, for a year, we would talk on skype to prepare for the experience. I remember that on one occasion she told me: "Look, Lupita, if you do not take this experience seriously, you will not discover what the Lord wants from your life." Her advice made me reflect on the fact that I should not waste my time, but take the opportunity to discover God’s will for my life more seriously. After a year of discernment, on February 11th, 2013 the feast of Our Lady of Lourdes, I entered the community of the Missionaries of the Divine Revelation. I would be lying if I say that these four years that I have lived in the community have been easy: difficulties and problems have arisen at every stage of this journey. At the same time, the Lord has given me His grace and the help of the community to overcome every trial. If you were to ask me if I regret having accepted the invitation to consecrated life, I would answer no; I would still choose Jesus Christ over and over again. On January 23th, 2015, the Lord gave me the grace to begin my first year as a novice. 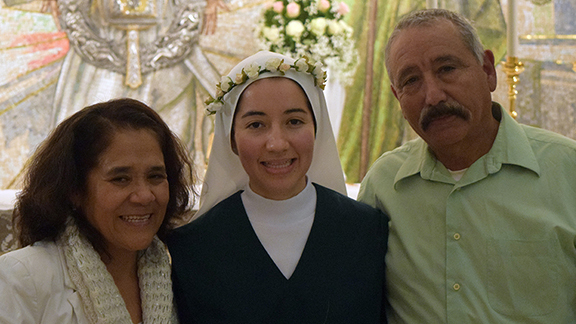 During the celebration, I received the religious habit, the white veil, the Holy Rosary for the first time. In addition, I was also given a new name: Sister Maria Angelica. After two years as a novice, on June 24th 2017, the solemnity of the Nativity of St. John the Baptist and also the Immaculate Heart of Mary, I had the grace to make my first vows. Before God, the community, my family and my loved ones, I freely professed my desire to live in poverty, chastity and obedience. I trust that God’s goodness will grant me grace and perseverance. Today, many people think that religious sisters have renounced love! However, this is impossible because loving is the inner vocation of every human being. We have been created for love and therefore it is natural to search for it. Often, we refer to this as happiness. The fulfillment of every person lies in following the vocation chosen for them by the Lord from eternity. Therefore, it is possible to see the importance of discerning a vocation because it opens the doors to happiness and fulfillment. The religious life represents the exclusive donation of one’s self in a relationship of deep intimacy with God. “God is love” (1 Jn 4:7) and as sisters we are called to unite all that we are to “love made man,” Jesus Christ. There is no greater s mission in life than this. Looking back on my life’s journey with the Lord, I have experienced the fact that God alone is enough to fulfill our hearts! You can learn more about the Missionaries of Divine Revelation on their website. You can follow the Missionaries of Divine Revelation on Facebook.